I groaned when I saw the headline. “Google Street View braves Canadian Arctic to chart little-known territory,” it read. “Iqaluit mapping expedition sees Google staff hike along remote city’s snow-covered trails and risk wrath of polar bears.” Even the writers and editors at the Guardian aren’t immune to the occasional bout of polar fever. But I can’t blame them. The rhetoric of exploration—of braving dangers on remote, inhospitable, and unknown frontiers—continues to sell newspapers and garner page hits. Public demand for tales of northern adventure, hardship, and heroism in high latitudes remains strong. Exploration has dominated popular conceptions of the Canadian North, out of proportion to its actual significance to life and work there. Could we, as historians, turn public fascination with this activity to our advantage, rather than ignoring it or dismissing it out of hand? What if we used exploration, and other northern topics of interest in southern climes, as a bridge to introduce southerners to different perspectives and stories in northern history, thus opening up the rich, diverse scholarship of recent years to wider audiences? This move could unsettle and complicate the representations of subarctic and arctic places that southern travellers have bequeathed to southern audiences, and that undergird our imaginative geographies of North even today. It’s an uncommonly apt moment for the destabilization of foundational narratives. The Arctic is undergoing a monumental transformation, to which we’re all bearing witness. Over the last decade, the world has watched northern ice and glaciers diminish year on year, and has feared for the fate of fauna dependent on frozen objects and ecosystems. Climate change has underscored the mutability of northern environments—a characteristic that past and present explorers have been always keen to downplay in their narratives. Instead, they painted the North as a permanent frontier, a harsh and unchanging place against which would-be explorers could always pit their wits and strength. This idea of North has survived into the present day among many southerners who have not travelled there. But a North frozen in place is a North outside of time. A place presented as static and unvarying is one inimical to historical analysis, which seeks to explain change over time. As the North thaws physically, perhaps it is also thawing imaginatively in southern minds, enabling new stories to fall on newly fertile ground. Even as climate change punctuates our entrance into a new century, the language and imagery of past centuries of exploration still shapes southern perceptions of northern environments. Familiar exploratory gestures and desires can reveal both continuities and discontinuities with the past, which historians are well placed to tease out. Consider the Northwest Passage, Canada’s exploratory landscape par excellence. Europeans sought this strait for five hundred years, first as an alternate trading route to Asia, then for its value as a geographical prize and national/imperial point of pride. The allure of the passage on both grounds still resonates today. There is widespread speculation that the decreased amount of summertime ice in the Arctic will finally render the Northwest Passage a viable shipping route between Europe and Asia. It is 9,000 kilometres shorter than the Panama Canal route, and 17,000 kilometers shorter than going via Cape Horn, after all! Yet this economic dream, nurtured throughout the history of exploration, will not come to pass for some time, if ever. 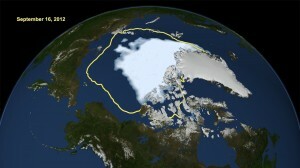 The Canadian Arctic archipelago will likely be one of the last areas of the Arctic with widespread summer ice cover. Its complex geography also continues to yield distributions and quantities of ice that are both highly variable and highly unpredictable from year to year. With the forecasting of ice patterns and rhythms difficult, if not impossible at the present time, shipping companies won’t send their containers through straits that may suddenly contain ice absent the year before. Costly delays are anathema in a fiercely competitive industry operating with razor-thin margins of profitability. Other industries venture where shipping companies dare not go. The rising popularity of cruise tourism in the Canadian Arctic has enabled latter-day explorers to take the Northwest Passage. Like the narrator in Stan Rogers’s song, they want to “find the hand of Franklin reaching for the Beaufort Sea”—but also to succeed where Franklin failed. Since 2010, about 40 vessels have made partial or full transits of the passage each summer, mostly in the service of the tourism industry. These travellers go North anticipating comforts and safeguards that their predecessors did not have. Yet they could just as well suddenly face situations no less dangerous than those encountered by past expeditions. Passengers on a cruise ship that ran aground—by no means an impossibility in the imperfectly charted waters of the Canadian archipelago—might soon discover the limitations of regional search and rescue capabilities. If such an incident occurred far from existing networks of infrastructure and settlement, injuries or fatalities could ensue. The imaginative afterlives of northern exploration could yet lead to new tragedies layered atop older ones. While clarifying the hold exploration still has on our actions and imaginations, historians can also bring northern voices and perspectives to the fore. Thanks to the efforts of many historians and northern communities, it’s now easier than ever to present multivocal accounts of episodes in northern history. In the undergraduate course on the global history of exploration that I taught this term, students read European and Inuit accounts of Frobisher’s first expedition to Baffin Island side by side. They saw how George Best, one of Frobisher’s men, presented the raw-flesh-eating Inuit as “subtle traitors” who captured five Englishmen. Then they read the reflections of Inookie Adamie, of Iqaluit, who recalled how poorly the Englishmen were dressed to Inuit eyes. These “ghostly” men wore “rags” that could never protect them from the cold. My students also perused the Canadian Museum of Civilization’s virtual exhibit on Frobisher’s voyages. In this retelling, the story begins and ends with Nunavut. The North is situated firmly as an ancestral and present-day Inuit homeland. A turn to northern voices makes it clear that the southern fascination with northern exploration is, many times, just that—a southern fascination. Stories from expeditionary narratives clash with the memories and sensibilities of northern communities. The geographer Emilie Cameron highlights this fact in her work on contrasting European and Inuit attitudes to the infamous “massacre” at Bloody Falls, memorialized by the English explorer Samuel Hearne and by subsequent European travellers to the Coppermine region. The community of Kugluktuk resists this interpretation. To them, the place is known as “Kugluk,” the rapids. In their view of the fishing, hunting, gathering, and camping sites that together make up Kugluk, and the “centuries of other stories and feelings” they emplot there, the massacre has no place or purchase. Northern historians know of the existence and significance of these stories, and others like them. Most Canadians, most southerners, don’t. When such people show interest in northern history, perhaps we should pay attention, and then give them some new stories, new histories, to place alongside the old. It is a propitious moment to begin this work. We live in the Anthropocene. Humanity has exerted large-scale changes upon the planet, the results of which are only now becoming widely recognized. People south of the Arctic Circle are learning that the North is not the remote and eternally frozen frontier that the explorers once affirmed it to be. Southern actions and decisions have altered northern spaces. The fate of northern and southern peoples and environments are bound ever more tightly together, and the immediate effects of the new geological age are now falling disproportionately upon the former. As we move further into this uncertain but shared future, it seems more crucial than ever before for southerners to hear, and to know the stories that matter most to people from the North. Tina Adcock is a postdoctoral fellow at the Rutgers Center for Historical Analysis. Dorothy Harley Eber, Encounters on the Passage: Inuit Meet the Explorers (Toronto: University of Toronto Press, 2008), 3-4. Emilie Cameron, “’To Mourn’: Emotional Geographies and Natural Histories of the Canadian Arctic,” in Emotion, Place and Culture, eds. Mick Smith et al. (Farnham: Ashgate, 2009), 163-83.